I feel so good, good, GOOD! I went to the track again today.. I pushed myself hard, made my heart beat fast and perspired a little too and achieved 15 laps (3 kms) in 30 minutes. It was tinged with a little sadness on seeing someone that was me not so long ago. She managed a few laps at a slow pace and in every step she took you could see the pain she suffered. I wanted to hug her.. tell her that all she had to do was keep coming back to walk a little and soon the pain would begin to disappear and her smile would broaden and there would come a day when she actually walked faster than someone else and one day she would realize there was no pain… and she’d cry with happiness..
Back to the track after 6 months. 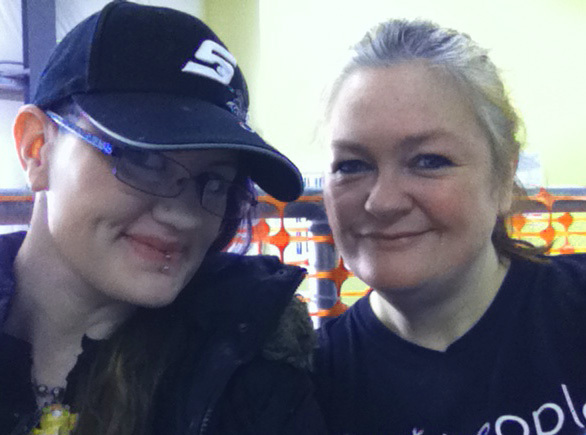 Today my daughter and I headed to the track..
We decided for the first time back I’d walk 30 minutes at a moderate pace (which normally worked out at 12 laps in 30 minutes which is about 2.5 km). We walked at a brisk pace and completed 13 laps in 30 minutes and then did a few cool down laps.. I hardly broke into a sweat and felt EXHILARATED!!! There is no doubt in my mind that the key to getting healthy and strong is not only eating a diet rich in vegetables, fruits, wholegrains, peas, beans, nuts and non-processed or minimally processed foods (like wartime rationing) but also taking regular exercise such as brisk walking especially if you can feel the sun on your face and the wind in your hair! It’s all rather simple really..
With possibly having to return to the UK in 3 months time I REALLY want to get back on track and greet my Mum and Dad weighing 100 lb less than when I last saw them 8.5 years ago. I may be greeting them with growing my grey hair out but I’ll be healthier and stronger and I’m sure they will be very happy to see that..
We await to hear from Canadian Immigration, the results for our PRRA. It’s our last chance of not having to leave Nova Scotia here in Canada. Realistically we know the chance of that having a positive outcome is very slim so I’ve been making what practical plans I can, should we have to return to the UK this summer. The good news is that our house is under offer. That is a huge relief..and I’m so pleased who it is going to. So now it’s time to once again, plan another journey into the unknown…I really thought finally I had found my Nirvana but obviously it was not meant to be and the road still beckons. After having lived in isolated or rural locations for 17 years, something by the way I have really enjoyed, I’ll be leaving the last 8 years of my life behind to live in a diverse, cosmopolitan city with lots of history, a very large student population, beautiful surroundings…. the home of Robin Hood, Nottingham. I want my children to have the opportunity of experiencing city life, being independent, building their own lives and being productive members of the community, they will have lots to offer. Pity we couldn’t offer that in Nova Scotia..
We will have a busy few months ahead planning our next life, I’ve just forgotten how the UK works, I’ve been away 8.5 years and have never returned once. I’m rather scared of all the responsibilities I have for so many lives and for the choices I am having to make. If there is one burning light at the end of the tunnel, it is that I will see my parents again. I’ve missed them so very much. I’ve come across a TV series that ran in the UK two years ago and I’ve started to watch it. I just had to share it with you in case you missed it too!! 109 Wartime Recipes to date! Hope you enjoy the historical culinary journey below and thank you for continuing to visit my blog and for having a go yourself at the recipes, in particular schools using the content as part of the national curriculum.. Recipe 17: Spam, Spam, Spam, Spam.. The cupboards were pretty bare today and I didn’t want to do a round journey of 40 minutes by car to visit our nearest store. 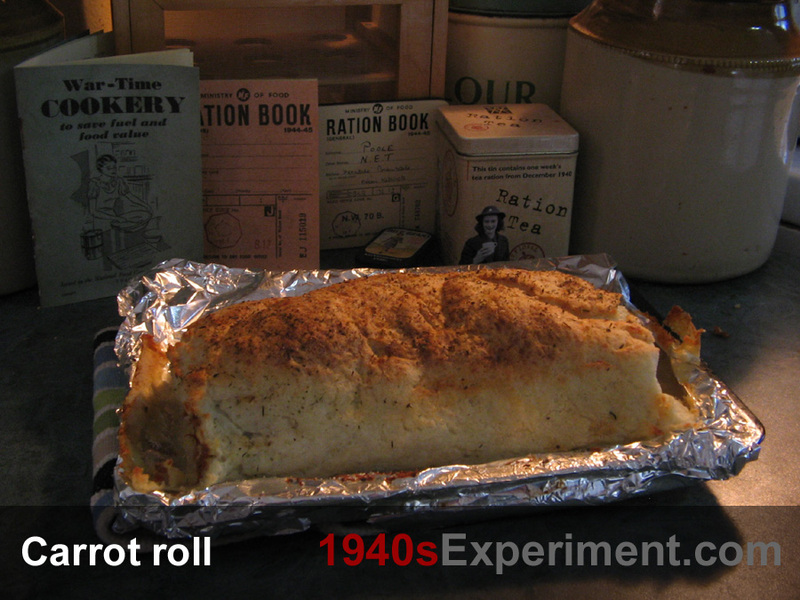 I found lots of potatoes and carrots so it was relatively easy to find a “1940s British Wartime Recipe” based on these…. 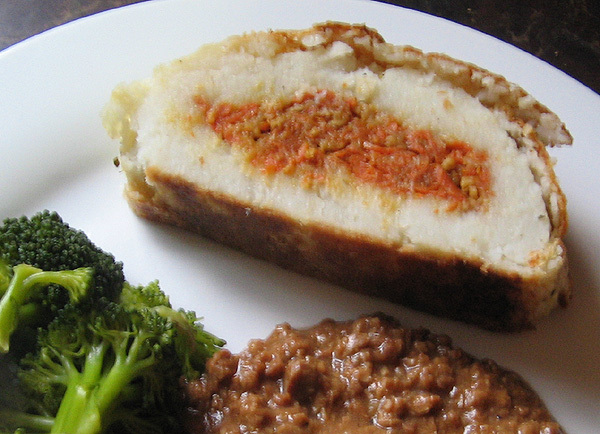 “Carrot Roll”. 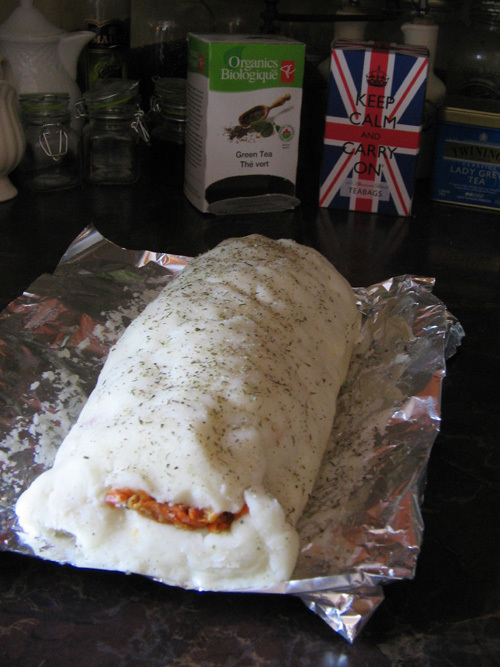 My initial thoughts were….gahhhh… sounds bland but infact, with plenty of seasoning and some dried herbs sprinkled over, it was very tasty and looked rather nice too! I happen to like potatoes a LOT so cooking this until the outside was nice and crispy, really added to the flavour and kept my love affair with the humble spud alive. As always, being a dietary vegan, I used a lactose free margarine. Place the carrot mixture along the centre longways and dot margarine along the top. Just a quick update but not a proper post..
Had some ups and downs, my current life is pretty chaotic and the emotions which go with them and I’ve had a little weight gain again. Not much but still…. I’m up to 240 lbs and not happy with that but not overwhelmed with it either. My psyche is still craving to become healthier and anything else is not an option, I just need to start focusing on my goals and working hard towards them again.